Gift giving is one of my most favourite things to do. I love the excitement of thinking of gifts that loved ones will enjoy opening. Just as much as the joy I get from shopping for them. With an imminent trip to New York for Black Friday ahead of us this week, we tend to do the majority of our Christmas shopping stateside every year. However, we do make a few trips to Newcastle City Centre. Especially to intu Eldon Square’s shopping centre to pick up some other bits and pieces. You may remember the other week I headed to the Nomination concession in the mall to pick out a composable bracelet for myself. I chose a selection of charms that had significant meaning to me. If you want to find out which ones I chose and why you can discover them here. Last week I headed back to make a start on my Christmas shopping and picked up a few gifts for the important ladies in my life. Firstly, and without being hedonistic here myself. You have to love yourself and look after yourself right? I decided to add some Green Opal (£27) and October Birthstone (white) to my Nomination composable bracelet. These stones are gorgeous and they really help bring the charms out. 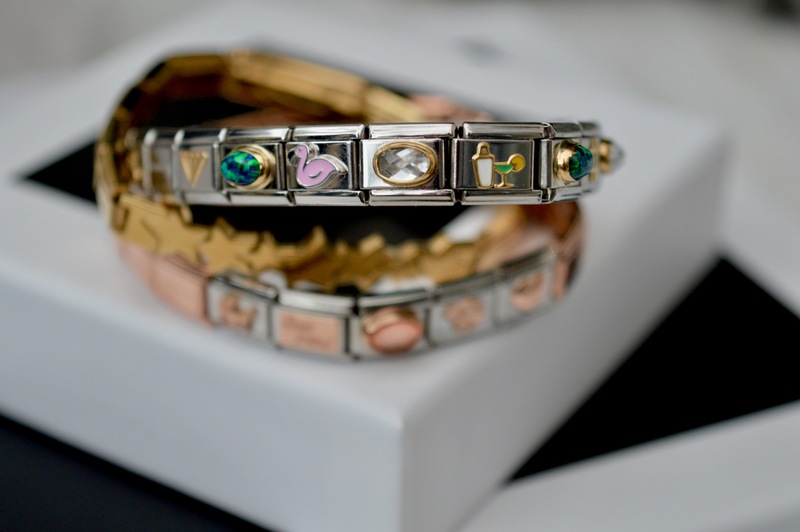 A little splash of colour brightens the bracelet and helps the flat charms pop. I chose the neutral white stones to break up the green opal. The green opal was to compliment the charms that had a prevalent green theme. To accompany the October white stones (£27) on my bracelet I picked up a pair of the Heart Shaped earrings in White (£65). These sterling silver and stone earrings come to life when the lights dances off them. They’re petite, however, they are a beautiful addition to any jewellery collection. 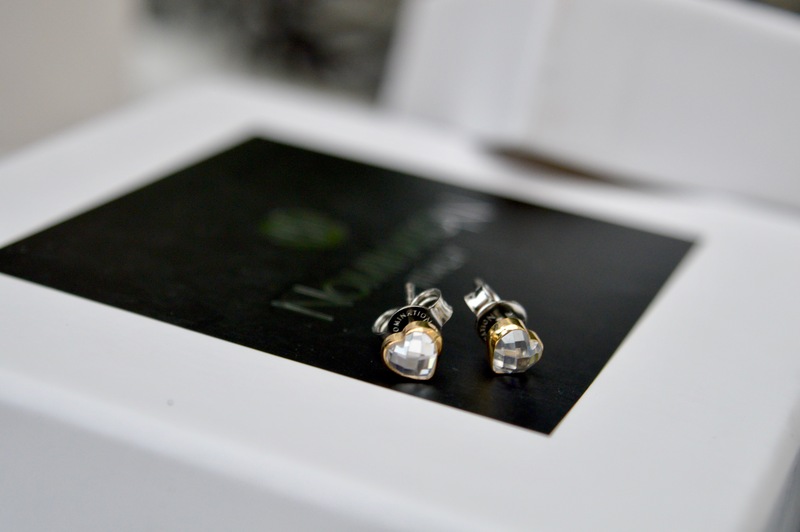 They would make for a great gift for a teen, finding her way with nice jewellery or an older family member who enjoys more subtle earrings. You’ll have probably heard me talking about my best friend Katie before. Not only did I plan her amazing hen do in Ibiza, but I also broke both my wrist and elbow at her wedding where I was maid of honour. Now I’m Godmother to her gorgeous little girl Gracie. As an only child, she’s the closest thing to a sister I have. So naturally, I really enjoy the thought process which goes into buying her a gift. As well as giving her a gift. Over the years we’ve been friends we’ve really started buying each other sentimental gifts and with Nomination, I personally think there’s nothing more sentimental than meaningful charms. With the addition of the rose gold charms and composable bracelets to the Nomination collection, I just knew that she would love this colourway. I began to select 5 charms for her that would sit nicely on her wrist, whilst not looking too overpowering. The great thing about Nomination is that the charms don’t dangle. Which is something she’s commented on, being a new mum, she’s struggling with anything that dangles. I chose the old-fashioned pushchair charm with pink stones for wheels as the first charm (£32) on her bracelet. This is pretty self-explanatory as her little girl is her world. Next up, the ‘best friend’ plaque charm (£22) as well, again, self-explanatory, as she is my best friend. The third charm, the focal point was the Classic Link Rock Crystal in Rose Gold (£32), which I chose because it was really eye-catching and gave a sophisticated twist to the bracelet. It also broke up the charms too. Next, I chose the classic ladybird charm (£15) a standing joke between both Katie and myself. This charm is subtle but really sweet. 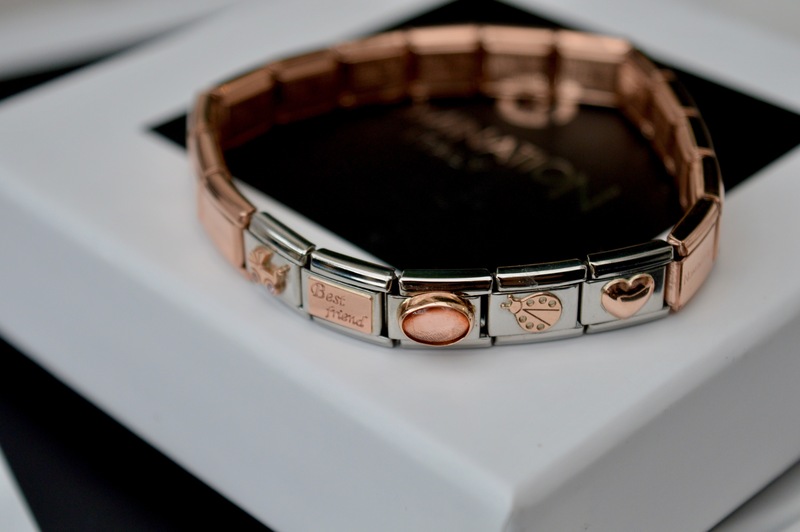 Finally, the rose gold heart (£15), which finished off the bracelet as it was really cute and kept the pattern of a flat and then raised charm going. I like odd numbers as I think it gives a greater wow factor and I know that come Christmas she will absolutely love this very personal and sentimental gift. Next up, my 16-year-old cousin. She’s a star in her own right. Having previously told you that she plays for the North of England Ladies’ Rugby team. An achievement that we’re very proud of, when she’s off the pitch she likes to get dressed up to go to parties. 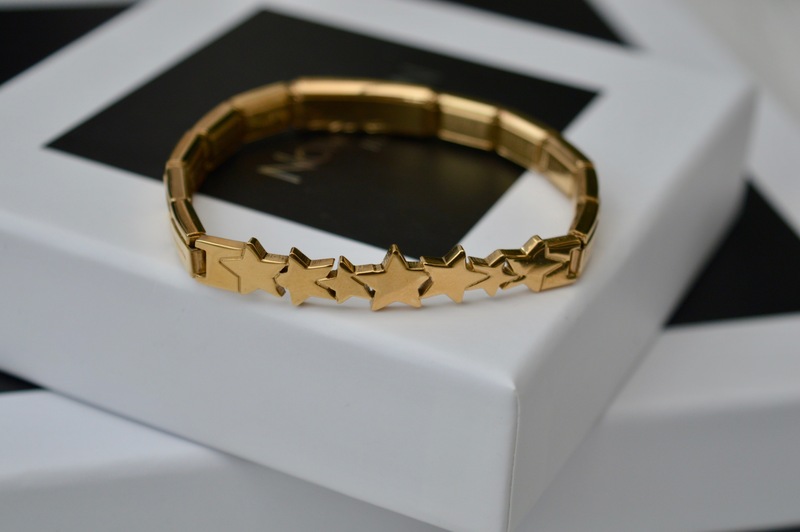 Enjoying accessorising with jewellery I selected the Trendsetter bracelet with stars in gold (£50). This simple, yet stunning bracelet is a beautiful piece on its own, or it looks equally as eye-catching stacked with the composable bracelets in both silver and rose gold. There is a selection of different patterns to these bracelets, however for our little rugby star, natural I chose the stars. I did try on the infinity band instore and have to admit that it is absolutely stunning on. 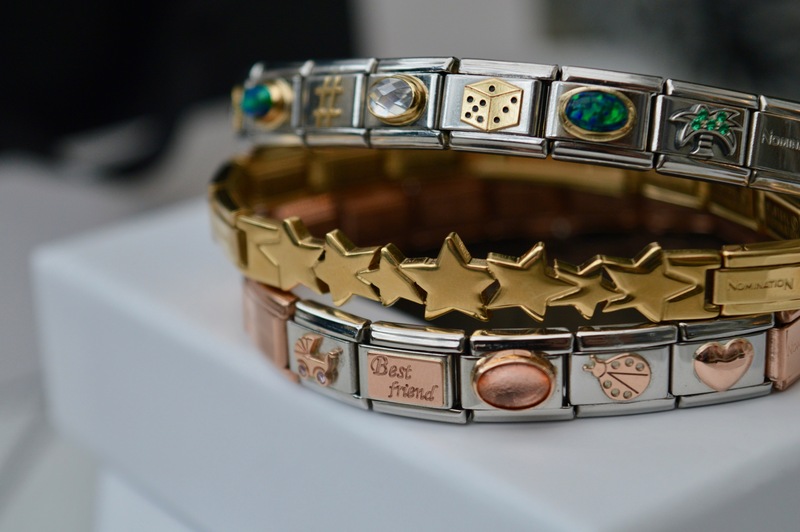 If I was choosing a Trendsetter bracelet for myself it would definitely be that one. New for winter Nomination has released the most adorable snowflake collection pieces in the form of their Winter Wishes range. I picked up the smaller snowflake and earring set as an early gift for my gorgeous Grandma. She loves to get into the Christmas spirit and spends 2 weeks getting the house decorated for Christmas. From the toilet paper to the cutlery, everything gets ‘Christmased’. 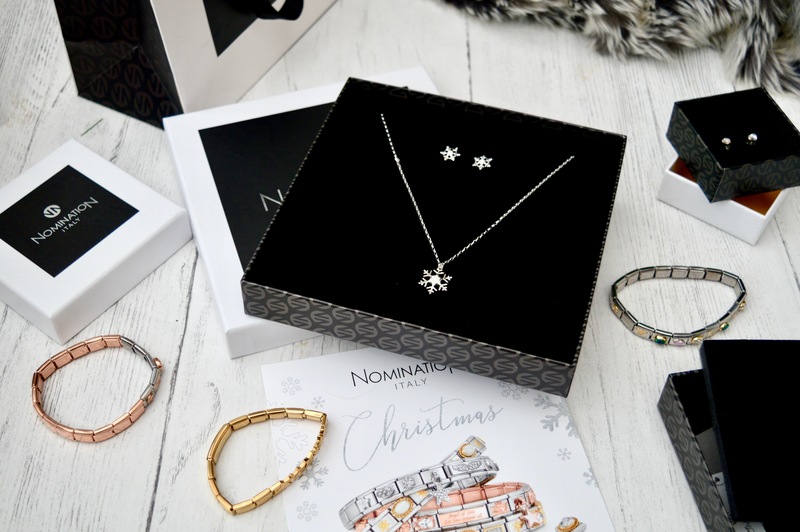 This sophisticated collection really caught my attention as I thought it would be a really subtle way for her to show her love of Christmas by wearing these snowflakes with sparkling stones in on the run up to Christmas! Finally, for this holiday period Nomination are giving away the most gorgeous jewellery case for all those who spend over £100. You’ve got to be quick though as the offer won’t last forever and stocks are limited. The jewellery cases are usually priced at £25 and personally, I think they’re worth their weight in gold. With a roll to store your bracelets on and a pocket for earrings, it’s great for sitting on your dressing table or for keeping your jewels safe when travelling. 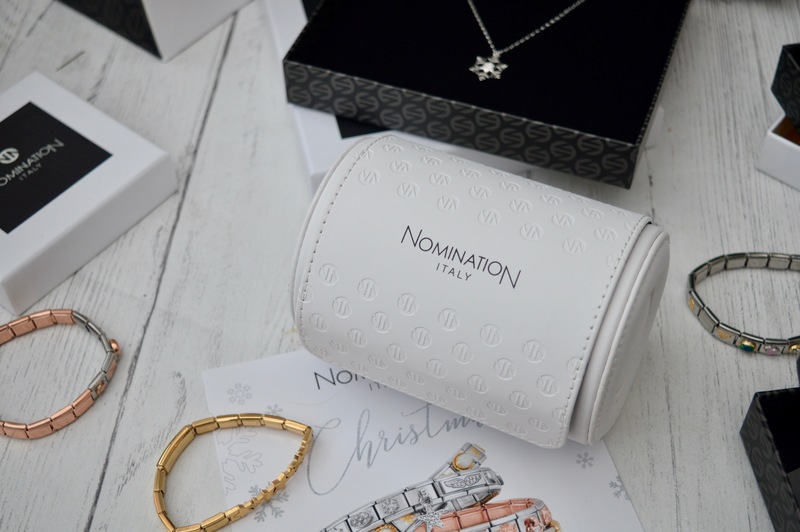 I hope you’re inspired to shop Nomination this year as I do absolutely love the personal touch that charm bracelets add. For a full list of stockists and to find your nearest Nomination retailer click here.